Wow. Sometimes I wish I ruled another planet so that I could dress like this every day. 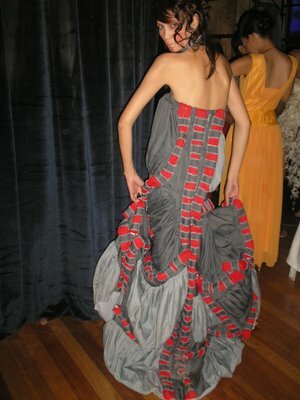 (From Pier Lim's collection at the Fashion Institute Student show in Manila- via manila style). Posted by la femme at 12:20 a.m.
Now that is called crazy beautiful. Thank link is for Woody Allen's "Sleeper" a hilarious futuristic satire I highly recommend. And the fashion is rather interesting as well. The 2004 spring and summer collection from Alexander Mcqueen oozed futuristic space details. Remember those metallic accents and crazy body suits? Also, if you haven't seen 2046 by Wong Kar Wai, you should see it just for the fashion. It has Chinese glamour from the 60's and android fashion. Anyways, your post reminded me of all of that.